It is hard to believe that another year has come and gone, but what a wonderful, full year it has been for our IB Parent Organization (IBPO) and our IB program. It has been a time of growth for our IB program and for our IBPO as we work together to make the experience as enriching and encouraging as possible for our students and staff. It has also been a year that our IBPO board has included parent support through our first educational meeting and social gathering. We heard from many of you that this was something you would like to continue, and we hope to be able to offer more of these events in the coming year. Please know that your membership dollars support these events and make teacher appreciation, student celebrations and parent gatherings possible. Our IBPO is thus far, the first organized parent organization for an academy at Woodrow, and I think it adds an additional sense of community and support for all of us. One of the meaningful traditions IBPO has offered is the senior luncheon. This was our 3rdannual event and, although it is not a mandatory event, all but three of our graduating seniors attended; giving the class one last time to be together with their friends, IB teachers, and Dr. Ritchie. I am always struck by the strong relationships the students have built with Dr. Ritchie, their teachers and each other, and it is always emotional as they share parting memories and hear words of support and guidance one last time. We are excited for our graduating seniors, knowing that they are well prepared for this new chapter in their lives, and hope they will keep us updated on their new adventures and experiences. Thank you all for the honor of serving as President this year of our IBPO. I know that it will be an organization that will continue to grow and provide a meaningful community for our program. This year Woodrow Wilson’s IB Diploma Program received over 250 applications for the 2018-2019 school year! 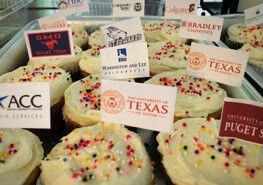 IB Academy acceptance letters were sent in February and in March the incoming IB freshman made their course selections. We look forward to welcoming 100 new IB Academy students in the fall! We are planning a kick-off social for these new IB Freshman families in August, so look for more details to come this summer! Wednesday, May 23rd the IBPO organized the traditional IB Senior Luncheon for our graduating seniors and IB staff. Thank you to Clay and Karin Deniger for opening their beautiful home up for this event. The IBPO provided Raising Cane’s chicken and we are so appreciative to the IB Junior parents who provided the sides, beverages, desserts, serving items and to those who came to set up, serve and clean up. It was delicious and everyone enjoyed spending this special time together in the final days before graduation. Here is the list of IB Summer assignments. Students should only complete the assignments for the courses in which they will actually be enrolled! AP Human Geography and AP World History--please contact Mr. Sim (Geography) or Ms. Khan (World History) to obtain any required assignments. IB Environmental Systems and Societies-- please contact Ms. O'Connell if you did not pick up your supplies from her before leaving campus for summer. IB History year 1-- Read Our Sister Republics: The United States in an Age of American Revolutions by Caitlin Fitz. Click here for assignment. IB Psychology year 2 only-- Ms. Joyal gave you an assignment before you left for summer. Please make sure you have this completed. SENIORS--EXTENDED ESSAY ROUGH DRAFT IS DUE ON AUGUST 20 at 9:00 a.m. Click here. Our Freshman have finished their first Woodrow IB year. No eggheads, these kids are playing golf, running track, kicking it up on Sweethearts, singing in musical, competing on Robotics, marching in Band, etc., etc. Next year they will be taking more pre-IB courses before transitioning to the official Diploma Programme as Juniors. We’ll celebrate that transition in the spring! Sophomores successfully wrapped up their second year of pre-IB classes and have made their course selections for next year. The upcoming Junior year is an important and challenging one. Students will have a heavy schedule of IB courses and begin their Extended Essays. This was a tough, challenging and very full year for our IB Juniors. In addition to their heavy IB class load, they began working on their Extended Essays, planned their CASS projects, prepared for college entrance exams, and conducted their college searches. All this in addition to excelling in all of the varied extra-curricular activities they participate in! Gearing up for the final year of the program, they will work on Extended Essay drafts this summer and prepare to send in college applications in the fall! IBPO provides refreshments to teacher meetings each six weeks. 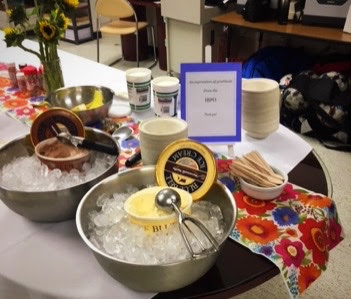 An Ice Cream Sundae bar was organized or the all of Woodrow’s teachers in the teacher’s lounge just before the 3-day Easter weekend. The teachers loved it and appreciated this yummy surprise. Parents are needed throughout the year to contribute and coordinate teacher appreciation and refreshments at student events. If you are interested in taking one of these jobs or helping out, please contact Carrie Fisketjon, our IBPO volunteer coordinator to find out how you can help! Thank you all for your continued support of the IB Program and the IB Parent Organization this year. Your support and involvement allow for our students to have the very best experience possible here at Woodrow. If you have not yet joined for this year, please do so to continue to receive this newsletter and other IBPO emails. There are opportunities throughout the year when your skills and talents will be greatly appreciated. If you are able, a suggested donation of $25 per IB student would go a long way towards funding our programs and events for this year. DISD does not provide funds to Woodrow IB and the IBPO makes up that gap to ensure these program events can happen. DONATE to IBPO - scroll to "Contribute"